Recently, we unveiled our Qualification Grant Finalists for September. Today, we’re excited to announce our $1,000 grant recipient –Karen Cohen, Founder of Omiga. Read on to learn about Karen’s inspiring mission and company. WN: How did Omiga come to fruition? Karen: 4 years ago, I received the phone call that every parent fears. My daughter was in the hospital. She’d been involved in a car accident. Worse, she was in police custody. She’d been out drinking all evening with friends and drove home…or tried to. Luckily, she survived and to put the icing on the cake, she no longer drinks. We were fortunate. Too many others aren’t as lucky. The statistics surrounding drunk and drugged driving are astounding. As a parent of an adult child, I felt powerless. I hadn’t been able to protect her. What I had was the belief that I had to do something, because whatever was being done wasn’t working. At the same time that my daughter had her accident, laws were being passed all over the country allowing use of medical and recreational marijuana. I knew this would only exacerbate the problem. Our brains function differently under the influence. We’re NOT thinking about consequences of our actions. I knew that if I were going to protect my children, my friends and neighbors, even myself from people who drive under the influence, I would have to take the decision-making away and make it impossible for them to do it. I sat down with my friend, now my business partner, and talked about a device that could detect the signs of physical and cognitive impairment in a subject and prevent a vehicle from starting if the driver was positive for those signs. I patented my ideas and formed Omiga to commercialize the patents. WN: How exactly does the technology work? Karen: The Omiga device, that we subsequently named The Visulyzer, resembles a virtual reality headset. The premise is that anything that affects the central nervous system results in obvious dysfunction of the voluntary and involuntary muscles of the eye. By testing how a subject’s eyes move and react to various stimuli during a battery of tests, we can easily determine if those signs are present. The device also videos the performance of the tests and the movements of the eyes and analyzes the video, creating an archivable record of the testing session. WN: Who are you planning to sell to — and through which channel(s)? Karen: Our markets are varied and vast. The Visulyzer can be used alone, or as an ignition interlock device to prevent a vehicle or piece of equipment from operating. It will be a valuable tool for Law Enforcement, businesses that have fleet vehicles, employees in at-risk occupations or any business that has liability for human error. Because it can detect impairment of the central nervous system, it can also be used by first responders to identify traumatic brain injury (concussion). It has several practical applications in medical diagnostics, and, of course, it can be valuable to consumers and parents just like me. WN: What are your plans for the grant money? Karen: No matter how careful one is with their expenditures, starting a business is a money pit. We currently operate out of my garage (figuratively speaking) and will continue to do so until we absolutely have to have office, quality control, warehousing and distribution space all under one roof. In the meantime, we have lots of pre-launch marketing and development costs. David and I don’t see taking salaries for another year or two and all funds get funneled back into raising funds for tooling and manufacture of the next prototype or travel expenses to continue to introduce our product and company to our identified markets. 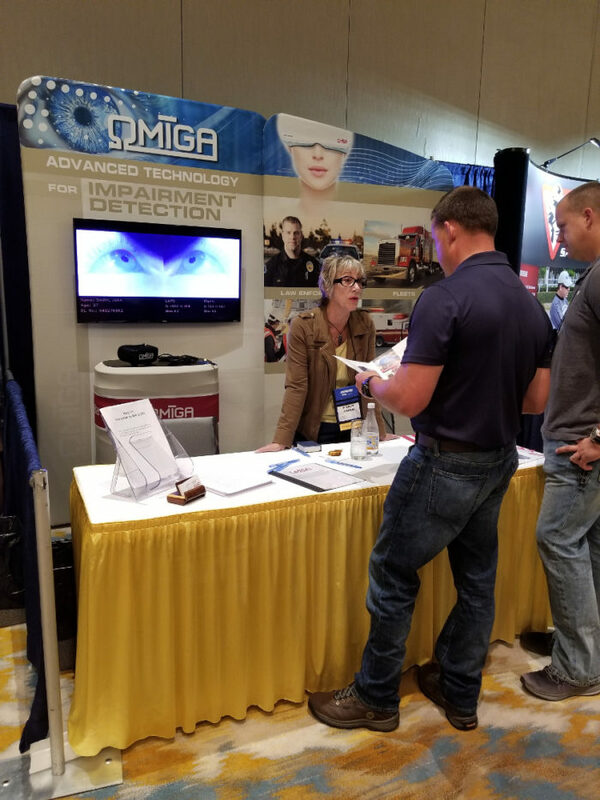 Recently, for instance, I exhibited our early prototype to the Governors’ Highway Safety Association annual conference in Louisville, KY (see the image above) and received an overwhelmingly positive response by representatives in law enforcement and public safety. Karen: 1. Write a business plan: Business plans are strategic GPS for success. Do your homework and research. Learn everything you possibly can about the business, the climate, the competition. Make sure you have a unique selling proposition that will be set you apart and also be compelling to your customers. 2. Seek mentors: We all have our limitations, and asking for help from those who’ve done what you want to do is the best way to learn–from their wins as well as their losses. And engage several mentors all at once. 3. Remain positive. People without courage or ambition will try to dissuade you. They’ll tell you all the reasons why you won’t succeed. So don’t be put off by that, it’s good and valuable information, actually, because knowing all the obstacles you’ll face allows you to prepare for them. 4. Let your “Freak Flag Fly.” Passion and belief are two of the most important characteristics because they are both attractive and infectious. If the people who can help you the most catch your “fever” they will lift and propel you toward your goal.